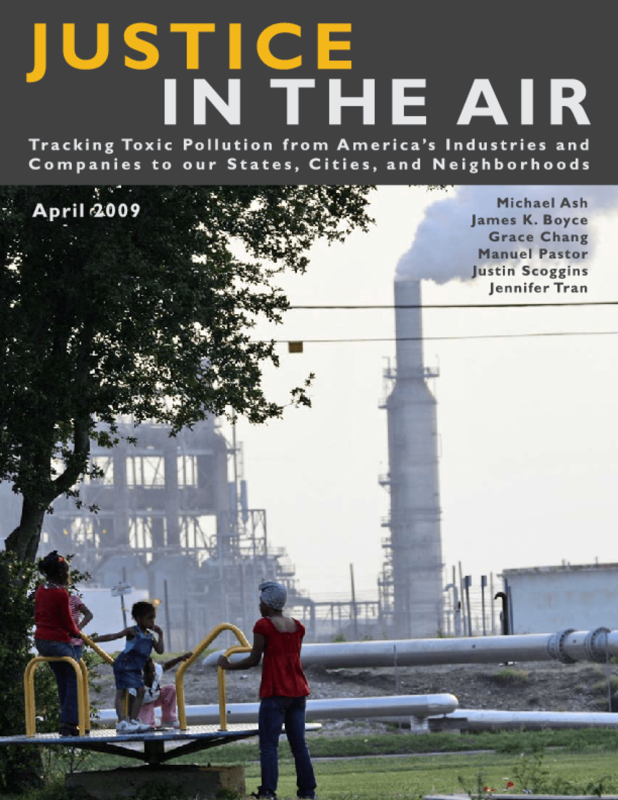 This new environmental justice study examines not only who receives the disproportionate share of toxic air releases -- low-income communities and people of color -- but who is releasing them.Justice in the Air: Tracking Toxic Pollution from America's Industries and Companies to Our States, Cities, and Neighborhoods uses the EPA's Toxic Release Inventory and Risk Screening Environmental Indicators to explore the demographics of those who are most affected by toxic pollution, and then establishes the corporate ownership of the plants responsible. Justice in the Air enhances the data available in PERI's Toxic 100 Report with a new environmental justice scorecard, ranking the Toxic 100 companies by the share of their health impacts from toxic air pollution that falls upon minority and low-income communities. The authors conclude by recommending four ways the right-to-know and environmental justice movements can use these findings in their efforts to protect the health of vulnerable communities.